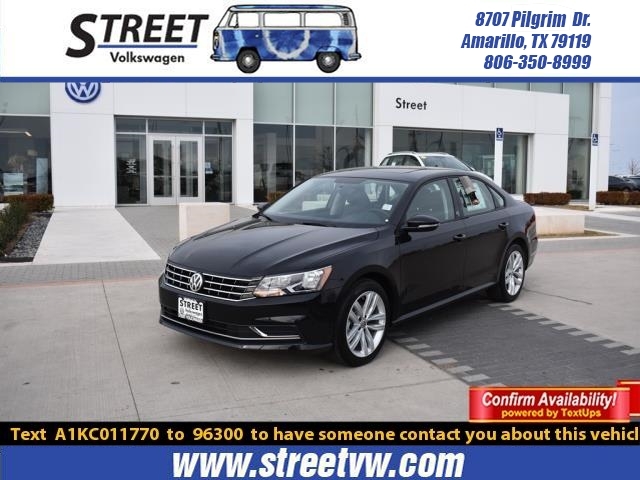 Roll up in style in our 2019 Volkswagen Passat 2.0T Wolfsburg EditionSedan displayed in Deep Black Pearl! Powered by a 2.0 Liter TurboCharged4 Cylinder that produces 174hp while paired with an innovative 6 SpeedAutomatic transmission that provides easy passing. Appreciate the efficiencyand reliability of this Front Wheel Drive Passat while scoring near 36mpg onthe highway! Take a seat in our Passat Wolfsburg and find yourself in abeautifully crafted cabin designed for maximum comfort including a sunroof. Youwill be immediately impressed by the leatherette heated front seats and theplentiful amenities including Bluetooth, a rearview camera, USB port, and a 6.3inch touchscreen audio with CD/AM/FM, auxiliary input, and SD memory card.Other notable features include keyless entry, push button start, dual-zoneautomatic climate control with pollen filter, cruise control, multi-functionsteering wheel, power windows, and 60/40-split folding rear seat. This Passat from Volkswagen shines regarding safety with awealth of active and passive features. Not only do you have the confidence ofABS, stability control, an army of advanced airbags, and a reinforced safetycage construction, but you also have automated emergency braking, rearcross-traffic alert, blind-spot monitoring, forward collision warning aswell as intelligent crash response. Safe, secure, and stylish, our Passat issure to please you. Print this page and call us Now... We Know You Will EnjoyYour Test Drive Towards Ownership! 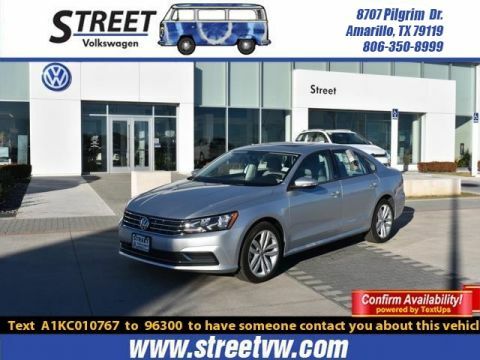 Thanks for choosing Street VW, yourVolkswagen dealership in Amarillo, TX.